You have always wanted a straight smile, but never wanted to deal with the appearance or restrictions of metal braces. As a result, you have considered clear aligners with Invisalign, but still have not committed to a treatment. Now, your dentist in Plano offers a unique approach using the most preferred treatment with Invisalign Go. You will enjoy the same benefits as the traditional aligners; however, you can now start to see results in as little as three months. If you have not invested in your smile yet, now is the perfect time to choose this innovative treatment. Invisalign Go is quite similar to the traditional option as is uses clear plastic aligners to align the teeth. You will enjoy the same discreet appearance without dealing with the restrictions of metal wires and brackets. However, you can now achieve faster results. The revolutionary new treatment offers quick results when used to correct minor crowding, spacing, and orthodontic relapse issues. It improves the alignment of the front teeth and the first premolars to create a flawless smile. Many are now turning to the advanced treatment because it offers faster results than traditional Invisalign. With the original aligners, you would finish your treatment in about 12 months, which is far quicker than that of traditional metal braces. However, now you can have the straight smile you have always wanted in as little as 7 months. While this treatment is effective, it is not an option for everyone. It can only be used on the top teeth and cannot be used for more complex alignment issues. To see if you are a candidate for the treatment, you will need a consultation to determine if it is right for you. Then, digital images are taken of your teeth, which are used with state-of-the-art software to map the treatment process to move your teeth. If it is determined that Invisalign Go is right for you, impressions are taken to create your series of aligners. You will then wear them for 22 hours per day with each aligner in the series worn for about 2 weeks. You will need a checkup about every 8 weeks to monitor the movement of your teeth. By the time you have your second appointment, you should already see your teeth starting to move into their new positions. 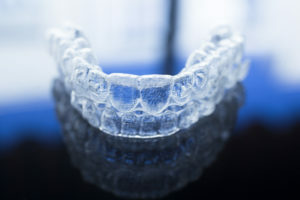 If you are finally ready to invest in your smile with clear aligners, it is time to see if you are a candidate for the new Invisalign in Plano. Dr. Bita Kamali provides a wide range of exceptional dental services due to her advanced training. She embraces the latest innovations and dental technologies to provide a higher level of care. At the state-of-the-art dental practice, you can benefit from many revolutionary new treatments, like Invisalign Go. If you have questions about the aligners, please contact Parkway Vista Dental to schedule a consultation.